Narrated By: Craig L. Blomberg, William W. Klein, Robert L. Hubbard Jr. 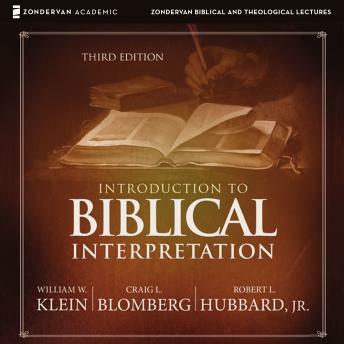 The Zondervan Biblical and Theological Lectures series provides a unique audio learning experience. Unlike a traditional audiobook's direct narration of a book's text, Introduction to Biblical Interpretation: Audio Lectures includes high quality live-recordings of college-level lectures that cover the important points from each subject as well as relevant material from other sources. the history of biblical interpretation,current discussions about finding meaning in written texts,the formation of the biblical canon and the task of translating Scripture,guidelines for reading biblical poetry and prose,identification of the various genres of the Old and New Testaments,and insights for understanding and applying Scripture today.Useful for formal students wanting additional instruction and for self-learners alike, Introduction to Biblical Interpretation: Audio Lectures by William Klein, Craig Blomberg, and Robert Hubbard provides an excellent, thorough primer on the discipline of biblical hermeneutics.